Lake Erie and several of its contributing rivers have been the sites of a number of environmental catastrophes. The “death” of the lake was announced in both the media and in the scientific literature back in the late 1960’s, and this pronouncement was punctuated by the fire that spread across the Cuyahoga River in Cleveland in 1969. More recently, green, toxic blooms of algae in the western regions of the lake and up Toledo’s Maumee River has returned the focus of the public to the conditions of the lake. The Great Lakes are a unique freshwater ecosystem not only because of their size (20% of all of the fresh surface water on Earth is contained in these lakes) but also because of their physical isolation from all of the other freshwater and marine ecosystems of the Earth. This isolation has allowed the flora and fauna of the Great Lakes to evolve in unique ways, but it has also caused the resulting plants and animals of the lakes to be especially vulnerable to the sudden intrusion of invasive species. Lake Erie is the shallowest of the five Great Lakes (its average depth is only 62 feet, and its western basin is especially shallow with average depths between 25 and 32 feet). The consequences of Lake Erie’s shallow depth are multifold: 1. It has the smallest volume of the five Great Lakes, 2. It has the shortest “water residence time” of any of the Great Lakes (only 2.6 years), 3. It is the first of the Great Lakes to freeze in the winter, and 4. It is the warmest of the Great Lakes in the summer. The shallowness and warmth of Lake Erie also makes it a particularly ideal habitat for plankton and the diverse food web of fish that rely on plankton for their energy. It is estimated that half of all of the fish in the Great Lakes live in Lake Erie! Lake Erie is also in the center of the midwestern industrial belt and has been used as a transportation and waste removal system for industry and the numerous municipalities that surround it. Approximately, 34 million people live along the shores and in the watershed of the Great Lakes! 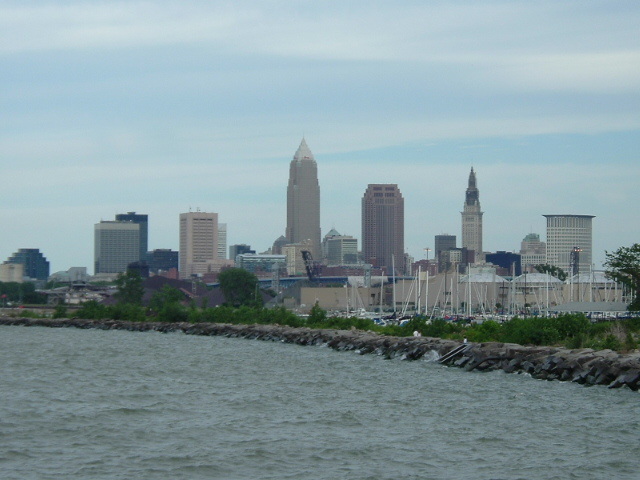 Lake Erie, because of its small water volume, is particularly vulnerable to industrial and municipal pollution. 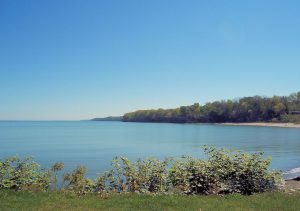 Lake Erie (and the other Great Lakes) have been subject to a number of ongoing stresses and cycles ever since Europeans settled upon its shores. Industrial and municipal wastes were relatively unregulated until the early 1970’s, and the lakes steadily built up larger and larger concentrations of sewage, toxic chemicals and metals. Transportation systems allowed first barge traffic and then entire ships to deliver ocean transported cargoes to the ports around the lakes. These systems include the Erie Canal (completed in 1825), the Welland Canal (first opened in 1829 and expanded and lengthened many time afterwards), and the Saint Lawrence Seaway (opened in 1959). These canals and seaways broke down the geographic barriers that isolated (and protected) the Great Lakes and allowed the invasion of exotic and invasive species into rich, but very fragile Great Lakes ecosystem. 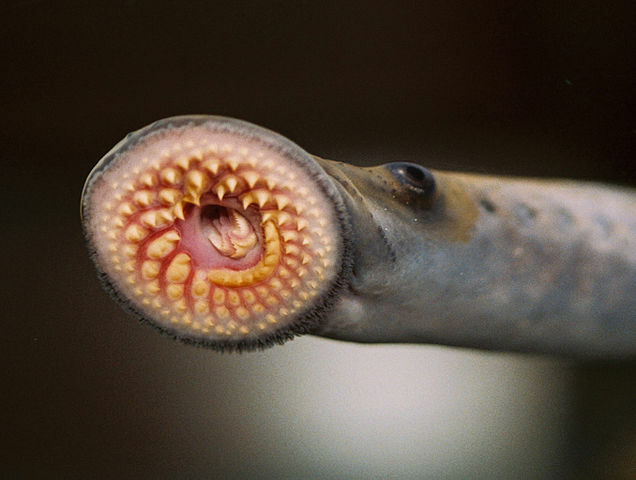 Sea lampreys were one of the first biotic invaders. They swam up the Erie Canal and hitched rides on boats through the Welland Canal. These predatory, jawless fish began to feed on lake trout and, until lamprey control methods were finally developed in the 1960’s, decimated the populations of these commercially important food fish and keystone predators of the Great Lake’s food web. Loss of the lake trout opened the lakes to an explosion of smaller, invasive fish including alewives. The exploding numbers of alewives, then, ate not only an abundance of plankton upon which other native fish species relied but also the eggs and immatures of many native fish species (including perch, lake herring and chubs). Introduction of Pacific salmon into the Great Lakes (particularly Lake Michigan) in the 1960’s was at least partially an attempt to re-establish a large predator in the lakes to control the alewives (which periodically experienced massive die offs because of the stress of life-long, freshwater existence (in their natural, Atlantic coast habitats alewives are anadromous and spend their adult lives in the ocean)). The salmon introduction is often praised as an economic and recreational boon, but this alien species of fish probably insured that the native lake trout would never be able to return to their pre-lamprey numbers and distributions. The Pacific salmon, though, did stimulate recognition of the recreational fishing potential of the Great Lakes, and, in doing so, made the public more aware of the lakes and also of some of the lakes’ problems. As thousands and thousands of salmon were being caught and processed and eaten from the lakes the healthfulness of their flesh came into question. Levels of the pesticide DDT were shown to be very high in the salmon, and later levels of PCB’s, dioxins and mercury. Concerns about health stimulated the public to demand safeguards against pollution, and these concerns were at least part of the impetus for the passage of the Clean Water Act of 1972. With the passage and enforcement of this act, the levels of pollution in the “dead” lakes began to decrease. 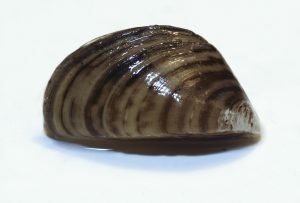 More exotic species invaded the lakes: zebra and quagga mussels in some places form a continuous covering across the lake bottoms choking out native bottom dwellers and disrupting delicate food chains. These mussels also build up to such large numbers that water intakes for factories, power plants and water treatment plants have become clogged. Ironically, along with all of this biological and physical disruption the mussels have also, through their constant filtration of the lake waters, improved the clarity and appearance of the lakes, but at a severe cost of their overall productivity. An article in The New York Times (October 3, 2017) described in vivid detail one of the latest rounds of Lake Erie’s environmental problems. A 700 square mile bloom of bright green algae (that includes potentially toxic cyanobacteria) covered the western end of the lake. The green plume, which also extends up the Maumee River at Toledo, was caused by excessive fertilizer runoff from surrounding agricultural lands. 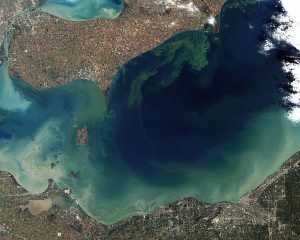 The size and duration of these late summer blooms have been increasing since 1985 as has the levels of dissolved phosphorus in the waters of Lake Erie. Ongoing global warming is only expected to make these blooms even more extensive and potentially even more toxic. I talked about the biology of these blooms back in 2014 (see Signs of Summer 1, June 12, 2014). On a small scale these algae blooms are dangerous, on a large scale, as we are now seeing in Lake Erie, they are potentially calamitous. So Lake Erie is back, but not completely. The algae are clogging its warm, western waters, invasive mussels are altering energy flow, and its fish are still contaminated with PCB’s and mercury. All of the Great Lake states have detailed descriptions of where you can “safely” fish (the least toxic sites) and where you cannot. They have also published descriptions of just how much (or how little) you can safely eat of the fish you catch( see Ohio Sports Fish Consumption Advisory, 2017). The beauty of lake, though, and it is a spectacularly beautiful lake, can lull you into thinking that there is nothing wrong anymore. We need, though, to use our brains rather than our hearts when we look at these lakes.